It is time to introduce another of our newer members. This week we are meeting Brooke from Bathory's Chainmaille. As always we posed some questions to Brooke, so let's go and see how she answers. 1) How long have you been a Chainmailler? I've been making chainmaille for about 4 or 5 years now. My cousin dabbled a bit and showed me how to do byzantine, and from there I fell in love with it. Now she has no time for it and I'm still going strong! Every time I see a new weave or trick, I just have to try it! steel still holds a special place in my heart. string out, and occasionally flipping them over my wrist to see my progress. 6) Which piece are you most proud of? There are two pieces I'm most proud of, actually. 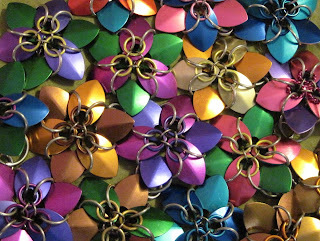 The first is my scale flower because it has become my signature piece. 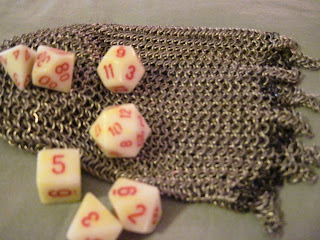 The second is a chainmaille bag I made for a DnD game. The bottom looks awful, but it was my first bag. It just takes so long for me to make a sheet to turn into a bag that that's the only bag I've made. The other few sheets I've made are used as, well, sheets. I my boyfriend and I both have one of my E-4n1 sheets and we put them on our faces if we get fever or too hot in the summer. WONDERFUL for that! Just couldn't turn them into bags after that. 7) What advice would you give to someone who was considering doing Chainmaille? Haha! 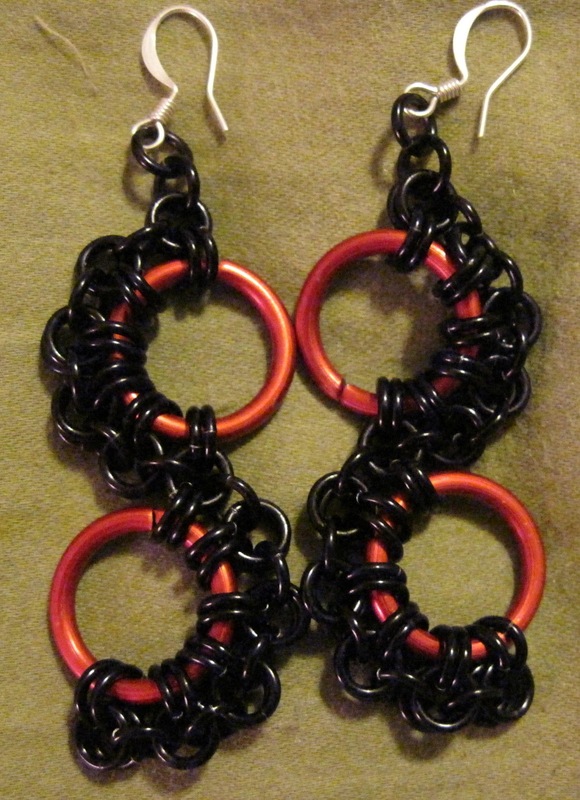 My advice to anyone trying to get into chainmaille is to contact me! I taught my boyfriend how to do chain and scale maille, taught 3 other people in my area how to do it, and at least 3 people have contacted me on Facebook asking me for advice. I send the people who contact me over the internet a pre-typed email now of really good tutorial site that I still use, several suppliers with my own brief description of each's service, and a few helpful and fun hints that I think they might find handy. I think I also have in there somewhere a run down of which metals are my favorites and why. One guy said he didn't have the money for one of those starter kits I linked him to, so I told him he could at least practice with coiled and cut paperclips to get the hang of some of the weaves. He's doing quite well, too! 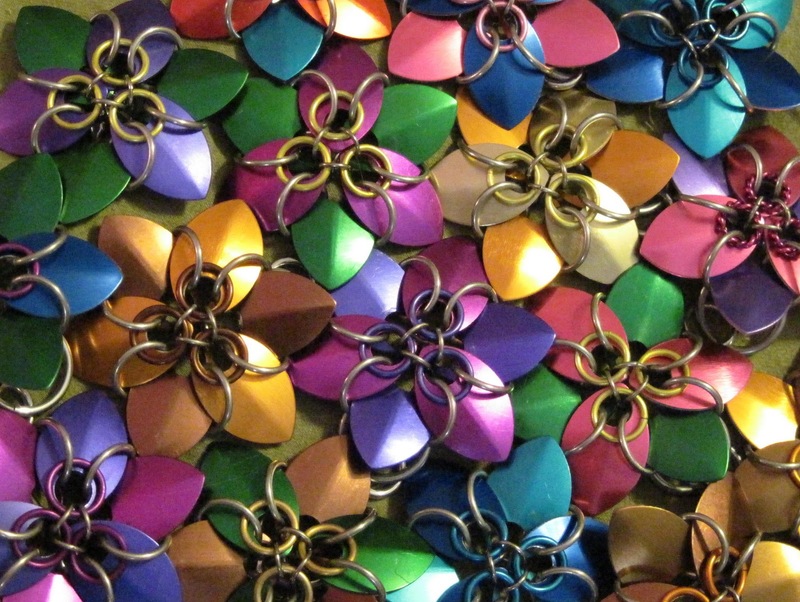 Thanks Brooke, and welcome to the ArtFire Chainmaille Guild.